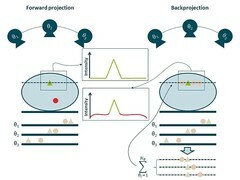 Limited Angle Tomography (LAT) is an X-ray imaging technique for generating a stack of cross-sectional images based on a limited number of two-dimensional projections. A low radiation dose and high in-plane resolution make LAT an attractive alternative to computed tomography. However, the incompleteness of the projection data results in image artifacts that may disable diagnostic interpretation. Our main research focus is the development and improvement of image reconstruction methods to reduce artifacts and increase the diagnostic value of LAT images. Fields of interest are for example the optimization of the projection access order for the Simultaneous Algebraic Reconstruction Technique (SART) and the development of weighting schemes for iterative reconstruction algorithms. Further investigations focus on the developing of alternative acquisition geometries to improve the LAT image quality without an increase in radiation dose. Left: An example for 1 of 25 tomosynthesis projections and four slices through the 3D reconstruction with typical artifacts. Right: Caused by handling of the inverse problem during the backprojection the summation of the projections leads to additional values in the reconstruction. Ziemann, C., Stille, M., Cremers, F., Buzug, T. M. and Rades, D.: Improvement of dose calculation in radiation therapy due to metal artifact correction using the augmented likelihood image reconstruction, Journal of Applied Clinical Medical Physics, 19(3), 227--233, 2018, DOI: 10.1002/acm2.12325. Ziemann, C., Stille, M., Cremers, F., Rades, D. and Buzug, T. M.: The effects of metal artifact reduction on the retrieval of attenuation values, Journal of applied clinical medical physics, 18(1), 243--250, 2017, DOI: 10.1002/acm2.12002. Stille, M. and Buzug, T. M.: Augmented likelihood image reconstruction with non-local prior image regularization, In: Proc. 4th Intl. Mtg. on image formation in X-ray CT, 145--8, 2016. Stille, M., Kleine, M., Hagele, J., Barkhausen, J. and Buzug, T. M.: Augmented Likelihood Image Reconstruction, IEEE Transactions on Medical Imaging, 35(1), 158-173, 2016, DOI: 10.1109/TMI.2015.2459764. Stille, M., Kratz, B., Müller, J., Maaß, N., Schasiepen, I., Elter, M., Weyers, I. and Buzug, T. M.: Influence of metal segmentation on the quality of metal artifact reduction methods, In: SPIE Medical Imaging, 86683C, 2013, DOI: 10.1117/12.2006810. Kratz, B., Ens, S., Kaethner, C., Müller, J. and Buzug, T. M.: Quality evaluation for metal influenced CT data, In: SPIE Medical Imaging, 83143Y, 2012, DOI: 10.1117/12.911349. Hamer, J., Kratz, B., Müller, J. and Buzug, T. M.: Modified Eulers Elastica Inpainting for Metal Artifact Reduction in CT, In: Bildverarbeitung für die Medizin, 310-315, 2012, DOI: 10.1007/978-3-642-28502-8_54. Kleine, M., Müller, J. and Buzug, T. M.: L1-Regularisierung für die Computertomographie mit begrenztem Aufnahmewinkel, In: Bildverarbeitung für die Medizin, 147-152, 2012, DOI: 10.1007/978-3-642-28502-8_27. Kleine, M. and Buzug, T. M.: Curvelet-based Inpainting for Metal Artifact Reduction in Computed Tomography, In: Image Formation in X-Ray Computed Tomography, 242-245, 2012. Duschka, R. L., Bischoff, P., May, K., Levakhina, Y., Buzug, T. M., Kovacs, A., Hunold, P., Barkhausen, J. and Vogt, F. M.: Digitale Tomosynthese - Ein neues Verfahren zur Beurteilung degenerativer Gelenkveränderungen im Vergleich zum konventionellen Röntgen, In: RöFo: Fortschritte auf dem Gebiet der Röntgenstrahlen und der bildgebenden Verfahren, VO216_4, 2012, DOI: 10.1055/s-0032-1311150. Kratz, B., Weyers, I. and Buzug, T. M.: A fully 3D approach for metal artifact reduction in computed tomography, Medical Physics, 39(11), 7042-7054, 2012, DOI: 10.1118/1.4762289. Kratz, B., Ens, S., Müller, J. and Buzug, T. M.: Reference-free ground truth metric for metal artifact evaluation in CT images, Medical Physics, 38(7), 4321-4328, 2011, DOI: 10.1118/1.3603198. Kleine, M., Hamer, J. and Buzug, T. M.: Sparse recovery for SPECT imaging of inflammation at implants, In: Proceedings Medizinische Physik, 64, 2011. Levakhina, Y., Kratz, B. and Buzug, T. M.: Two-Step Metal Artifact Reduction Using 2D-NFFT and Spherically Symmetric Basis Functions, In: Nuclear Science Symposium and Medical Imaging Conference, 3343-3345, 2010, DOI: 10.1109/NSSMIC.2010.5874424. Buzug, T. M.: Computed Tomography: From Photon Statistics to Modern Cone-Beam CT, Springer, Berlin, 2010, DOI: 10.1007/978-3-540-39408-2. Yu, L., Li, H., Mueller, J., Kofler, J. M., Liu, X., Primak, A. N., Fletcher, J. G., Guimaraes, L. S., Macedo, T. and McCollough, C. H.: Metal Artifact Reduction From Reformatted Projections for Hip Prostheses in Multislice Helical Computed Tomography, Investigative Radiology, 44(11), 691-696, 2009, DOI: 10.1097/rli.0b013e3181b0a2f9. Kratz, B. and Buzug, T. M.: Metal artifact reduction in computed tomography using nonequispaced fourier transform, In: Nuclear Science Symposium and Medical Imaging Conference, 2720-2723, 2009, DOI: 10.1109/NSSMIC.2009.5401974. Kratz, B. and Buzug, T. M.: Metallartefakte in der Computertomographie. Softwarebasierte Ansätze zur Artefaktreduktion, In: Jahrestagung der Gesellschaft für Informatik, 1213-1222, 2009. 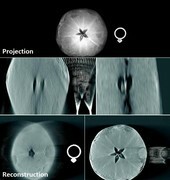 Müller, J. and Buzug, T. M.: Spurious Structures Created by Interpolation-Based CT Metal Artifact Reduction, In: SPIE Medical Imaging, 72581Y, 2009, DOI: 10.1117/12.813515. Kratz, B., Knopp, T., Müller, J., Oehler, M. and Buzug, T. M.: Comparison of Nonequispaced Fourier Transform and Polynomial based Metal Artifact Reduction Methods in Computed Tomography, In: Bildverarbeitung für die Medizin, 21-25, 2008, DOI: 10.1007/978-3-540-78640-5_5. Müller, J. and Buzug, T. M.: Intersection Line Length Normalization in CT Projection Data, In: Bildverarbeitung für die Medizin, 77-81, 2008, DOI: 10.1007/978-3-540-78640-5_16. Oehler, M., Kratz, B., Knopp, T., Müller, J. and Buzug, T. M.: Evaluation of surrogate data quality in sinogram-based CT metal-artifact reduction, In: Image Reconstruction from Incomplete Data, 1-10, 2008, DOI: 10.1117/12.793622. Oehler, M. and Buzug, T. M.: Sinogram Inpainting for Metal Artifact Reduction in CT Images, In: European Conference of the International Federation for Medical and Biological Engineering, 651-654, 2008, DOI: 10.1007/978-3-540-89208-3_155. Kratz, B., Knopp, T., Oehler, M., Ens, S. and Buzug, T. M.: CT-MAR Reconstruction Using Non-Uniform Fourier Transform, In: European Conference of the International Federation for Medical and Biological Engineering, 861-865, 2008, DOI: 10.1007/978-3-540-89208-3_206. Oehler, M. and Buzug, T. M.: A Sinogram-Based Metal Artifact Suppression Strategy for Transmission Computed Tomography, In: Geometriebestimmung mit industrieller Computertomographie, 255-262, 2007. Oehler, M. and Buzug, T. M.: The λ-MLEM Algorithm: An Iterative Reconstruction Technique for Metal Artifact Reduction in CT Images, In: Springer Proceedings in Physics, 42-47, 2007, DOI: 10.1007/978-3-540-68764-1_6. Buzug, T. and Oehler, M.: Statistical Image Reconstruction for Inconsistent CT Projection Data, Methods of Information in Medicine, 46(3), 261-269, 2007, DOI: 10.1160/me9041. Oehler, M. and Buzug, T. M.: Two Step MLEM Algorithm for Artefact Reduction in CT Images, Computer Assisted Radiology and Surgery, 2(1:1), 38-41, 2007, DOI: 10.1007/s11548-007-0082-8. Oehler, M. and Buzug, T. M.: Modified MLEM Algorithm for Artifact Suppression in CT, In: Nuclear Science Symposium and Medical Imaging Conference, 3511-3518, 2006, DOI: 10.1109/NSSMIC.2006.353757. Oehler, M. and Buzug, T. M.: Gewichtete MLEM-Rekonstruktion zur Artefaktreduktion in der Transmissions-Computertomographie, In: Jahrestagung der Deutschen Gesellschaft für Medizinische Physik, 345-346, 2006. Oehler, M. and Buzug, T. M.: Statistische Bildrekonstruktion zur Behandlung inkonsistenter Projektionsdaten der Computertomographie, In: Deutsche Gesellschaft für Biomedizinische Technik Jahrestagung, 2006. Oehler, M. and Buzug, T. M.: Maximum-Likelihood-Ansatz zur Metallartefaktreduktion bei der Computertomographie, In: Bildverarbeitung für die Medizin, 36-40, 2006, DOI: 10.1007/3-540-32137-3_8. Oehler, M., Pfaffmann, L. and Buzug, T. M.: Artefact Suppression in Computed Tomography using Iterative Reconstruction Methods, In: Deutsche Gesellschaft für Biomedizinische Technik Jahrestagung, 1130-1131, 2005. Oehler, M., Pfaffmann, L. and Buzug, T. M.: Reduction of Metal Artifacts in Computed Tomography, Computer Assisted Radiology and Surgery, 1281, 1310, 2005, DOI: 10.1016/j.ics.2005.03.024. Oehler, M. and Buzug, T. M.: CT Artifact Reduction with an Iterative Maximum Likelihood Approach, In: Computer Aided Surgery around the Head, 44, 2005.